On Friday, Madrid stripped Catalonia of its autonomy and removed Catalan leader Carles Puigdemont from office. The temporary move will see as many as 150 of the region's ministers replaced. Some have vowed to continue to work. Mr Puigdemont and other Catalan officials may face criminal charges, a move likely to lead to huge protests. Spain's central government is set to take control of Catalan institutions with Spanish officials expected to be put in place in the region's ministries on Monday. Madrid has called for the Spanish constitutional court to revoke Catalonia's unilateral vote for independence. Mr Puigdemont and his vice-president Oriol Junqueras say they do not accept the moves by Madrid, adding that they can only be removed from office by the citizens of Catalonia. If Mr Puigdemont and others refuse to step aside, they face possible arrest and prosecution on charges of rebellion - the maximum sentence for which is 30 years. About 200,000 civil servants are due to arrive on Monday, but it is not clear how many will stay away or refuse to follow instructions. The former Catalan Sustainability Minister, Josep Rull, said he was continuing with his "scheduled agenda" and posted an image on Twitter showing him at his desk. "I'm at the office carrying out the responsibilities that the people [of Catalonia] entrusted to us," he wrote. However, Madrid has given Catalan ministers hours to pack up their belongings and leave their offices or Catalonia's regional police force, known as Mossos, will "act". Mossos, whose chief was dismissed last week, are deployed in Sant Jaume square, near the government palace in the centre of Barcelona. Spain's Foreign Minister Alfonso Dastis has said he expects the officers to "act professionally". 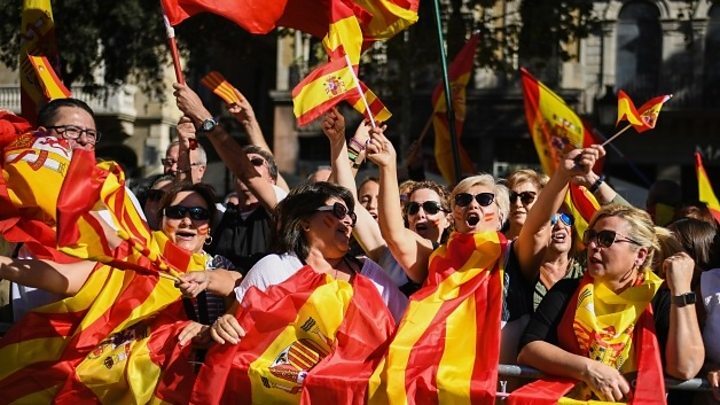 Spain's chief prosecutor has also been preparing criminal charges against any officials considered to have acted against Spanish law in declaring independence following a referendum deemed illegal under the Spanish constitution. Meanwhile, Madrid has called for fresh regional elections on 21 December. Mr Puigdemont could run in new elections, according to Mr Dastis, but only if the sacked Catalan leader has not been jailed. On Monday, Mr Dastis said he hoped the forthcoming elections would help to "restore legal governance and rule of law in Catalonia". "We hope and believe that after these elections, Catalonia will again be the same society it was before: open and integrated," he said during a press briefing in the Ukrainian capital, Kiev. Meanwhile, Interior Minister Juan Ignacio Zoido has written to all police officers in Catalonia asking for their loyalty as a "new era" begins in the region. Senior police officers have told the BBC that they have already complied with an order to remove framed photographs of Mr Puigdemont from police stations across the region. What is the local press saying? The centre-left and unionist Madrid-based El País says that Sunday's huge pro-union protest in Barcelona "has shown in this difficult moment that Catalan society is much more plural than what the pro-independence block strives to show"
The pro-union Barcelona-based El Periódico says the protest was the "start of the election campaign". 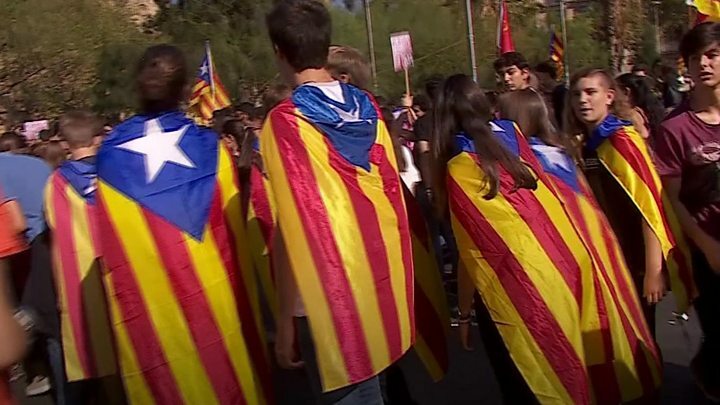 It adds that "the new regional elections should serve to move Catalonia out of its current impasse"
Spain has been gripped by a constitutional crisis since a referendum, organised by Mr Puigdemont's separatist government, was held earlier this month in defiance of a ruling by the constitutional court which had declared it illegal. Friday saw the regional parliament declare independence. Spanish Prime Minister Mariano Rajoy then announced the dissolution of the regional parliament and the removal of Mr Puigdemont as Catalan leader. Mr Puigdemont has urged "democratic opposition" to direct rule from Madrid.